In a thrilling finish of the $175,000 Dance Smartly Stakes (G2T), Starship Jubilee and Rainha Da Bateria flew down the stretch past favorite Suffused and hit the wire at the same time, resulting in a dead heat July 2. It was the third graded stakes win for Lael Stables’ 5-year-old Rainha Da Bateria and the second for Kevin Attard and Soli Mehta’s 4-year-old Starship Jubilee, who both finished the 1 1/4 miles on the firm Woodbine turf in 2:02.92. In Sunday’s test for fillies and mares, Belle de Nuit lead the field through the early stages of the race as Starship Jubilee and jockey Eurico Rosa da Silva pressed the pace from second and Rainha Da Bateria, with Javier Castellano up, raced in fifth. The frontrunner took the eight-horse field through fractions of :25.75, :50.38, 1:15.01, and 1:38.61 for a mile. Going three wide on the turn and into the stretch, the Chad Brown-trained Rainha Da Bateria began to close hard on the outside as Starship Jubilee got by the leader and held off odds-on favorite Suffused. Both runners charged down the stretch and hit the wire simultaneously, a half-length in front of Involuntary in third. Suffused settled for fourth. Gamble’s Ghost, Belle de Nuit, Uchenna, and Giovanna Blues completed the order of finish. “When I turned for home, I think I moved a little early because I had so much horse. But I said, ‘I’m going to try my luck here,'” said da Silva of his winning ride. Rainha Da Bateria returned $4, $3.90, and $3.30, while Starship Jubilee paid $5.90, $4.60, and $4.40. Rainha Da Bateria was fourth last out in the grade 3 Beaugay Stakes at Belmont Park, her season debut. She now has a 4-4-2 record from 19 starts, including three graded wins and five graded placings, with earnings of $589,160. The daughter of Broken Vow was bred in Kentucky by Alexander Groves Matz and is out of the stakes winning Dixieland Band mare Amelia. She was purchased by Borges Torrealba Holdings at the 2013 Keeneland September yearling sale for $435,000. 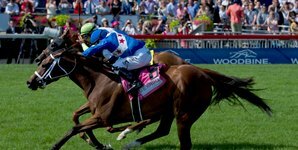 Starship Jubilee is on a five-race win streak going back to March, as she entered Sunday’s race off a 2 1/2-length score in the Nassau Stakes (G2T) at Woodbine May 27. From 14 starts, the daughter of Indy Wind has eight wins and earnings of $258,830. Bred by William Sorren in Florida out of the unraced Forest Wildcat mare Perfectly Wild, the filly was a $6,500 yearling purchase at the 2014 OBS August yearling sale by Laurence Leavy.